Aug. 12, 2017 marked the 10th anniversary of the disappearance of Haitian human rights activist Lovinsky Pierre-Antoine, then 52, who had days earlier announced his candidacy for Senator under the banner of the Lavalas Family party of then-exiled former President Jean-Bertrand Aristide. Lovinsky had just finished a busy day of meetings and travel to Haiti’s countryside with an international human rights delegation, whose members he had dropped off at their guest-house further up the Delmas Road from his home behind the studios of Haitian National Television (TNH) on Delmas 33. Alone, he drove away from them in a jeep that night of Aug. 12, 2007 and was never seen again. Hearing of the disappearance, Haïti Liberté journalist Kim Ives called Lovinsky’s cell phone about 36 hours later, on the afternoon of Aug. 14. 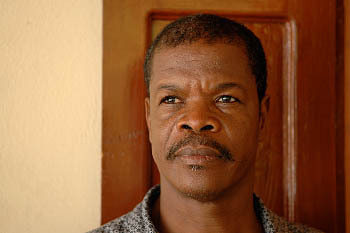 “At that time, it was not known that Lovinsky was kidnapped, just that he had disappeared,” reported Haïti Liberté on Oct. 21, 2007. “The man who answered the cell phone told Ives that Lovinsky had indeed been kidnapped. ‘I am responsible for this affair [the kidnapping],” the man told Ives. ‘Why have you kidnapped him?” Ives asked. ‘For money,” the kidnapper responded. by Jonathan M. Katz. Originally posted at Salon.com. What caused Haiti’s cholera epidemic? The CDC museum knows but won’t say. Last Friday, a friend doing research at the U.S. Centers for Disease Control and Prevention in Atlanta sent me a photo of a display at the CDC’s in-house museum. She thought I’d be interested because it had to do with the cholera epidemic in Haiti, which I lived through at its beginning and have been reporting on ever since. To understand what’s so insane about it, you need to know a little about two of the maps in that image and the CDC’s history with the epidemic. The main part of the map, that pink-and-red mass that looks like a crab claw, is Haiti. 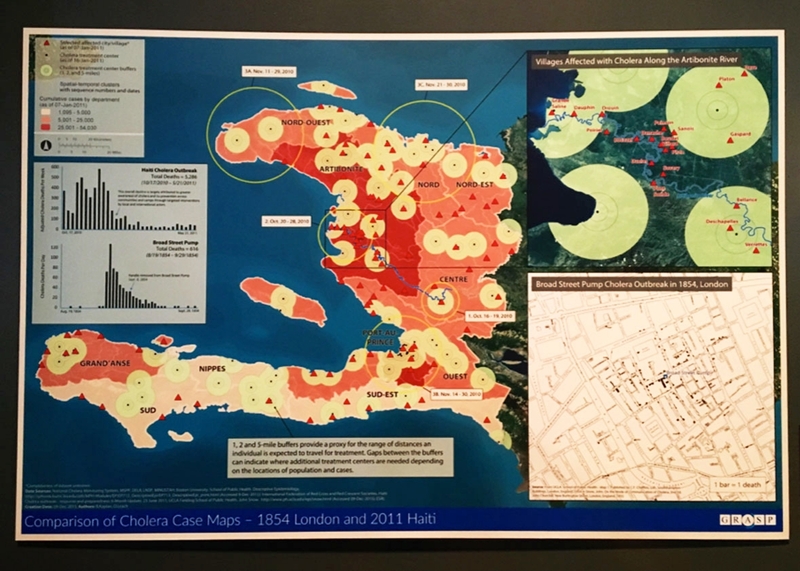 Specifically, it is Haiti at the height of the worst cholera epidemic in recent history, an incredible scourge that by official count has killed at least 9,265 people and sickened 775,000 people in that country alone—figures that many experts believe are wild underestimates. Even though this map is just a snapshot from early January 2011, less than three months into an epidemic that has now been raging nearly six years, you’ll note that already not a single part of the country has been left untouched. (The red areas are home to 25,000 cases or more; the pale pink areas, at least 1,000.) By then, the disease had already spread into the neighboring Dominican Republic and would soon be in Cuba, Venezuela, Mexico, and other parts of the region. Since the Feb. 6 agreement reached between outgoing President Joseph Michel Martelly and the presidents of the Parliament, Jocelerme Privert (Senate) and Cholzer Chancy (Chamber of Deputies), there was no doubt that the interim president would be Jocelerme Privert. Both the 1987 Constitution and the “Group of Eight” (G8) opposition presidential candidates called for a judge of the Supreme Court (Court de Cassation) to fill the presidential vacuum. So the Organization of American States (OAS) – Washington’s “Ministry of Colonial Affairs” – in league with the outgoing Martelly clique and Haiti’s ruling class, had to find a formula with a veneer of legality and compromise. Moreover, they needed an interim president who could act as a fireman to pacify Haiti’s streets while at the same time neutralizing Haiti’s formal and informal opposition groups, particularly the G8. 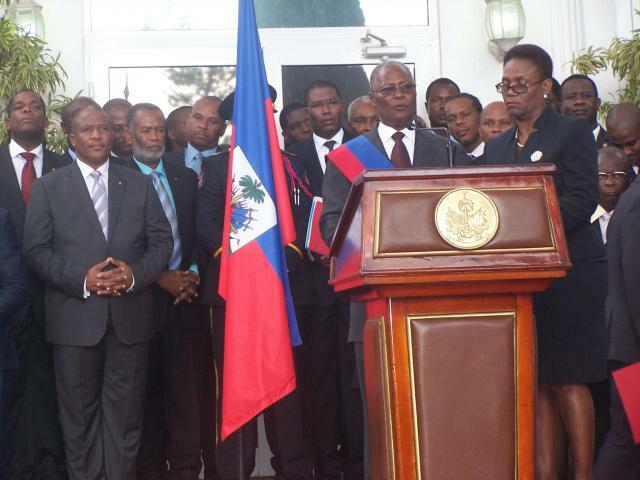 Since Feb. 7, when Martelly handed the presidential sash to Privert (then President of the National Assembly), the theatre in the halls of power is just to blunt and bluff the revolutionary upsurge that has been boiling across Haiti and assure a smooth transfer of from one neo-colonial regime to another. The majority of parliamentarians came to their seats through the same violent, fraudulent elections of Aug. 9 and Oct. 25, 2015 that have sent the masses into the streets demanding their annulment. So the supposedly democratic “debate” in this rump Parliament is only to fool the naive, silence the recalcitrant, and open the door to haggling for ever-coveted ministerial posts. What drama they were able to generate with a very tight first vote in the Parliament! In the Senate, Privert got 13 votes and Edgar Leblanc Fils, of the Struggling People’s Organization (OPL), 10. Among the Deputies, Privert got 45 votes and Leblanc got 46. 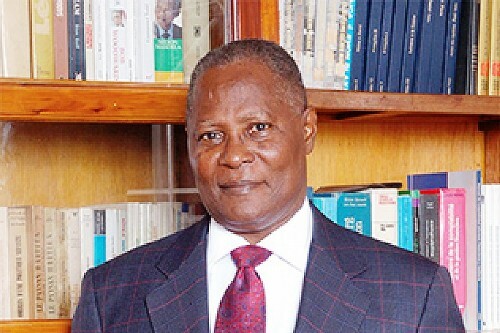 There was one blank ballot and not one vote for Déjean Bélizaire, a former Senate president in 1991 before the coup d’état against former President Jean-Bertrand Aristide. The former head of Haiti’s Senate and National Assembly was elected the country’s interim president Sunday after a vote that went to a second round and took nearly 12 hours. Jocelerme Privert, 62, beat out two other candidates — both were former Senate presidents as well — to lead a 120-day provisional government charged with organizing Haiti’s twice postponed presidential and partial legislative runoffs. His historic election is part of an accord that hopes to address the constitutional and institutional crises created by former President Michel Martelly’s departure from office. Martelly left office a week ago Sunday without an elected successor because of the disputed Oct. 25 presidential first round. Opposition parties and local watchdog groups have been insistent that the vote was marred by “massive” fraud in favor of Martelly’s handpicked successor, Jovenel Moïse. A relatively unknown serial entrepreneur who goes by the moniker “Banana Man,” Moïse, has denied the allegations. Still, the allegations have triggered violent street protests, calls for a vote verification and a boycott by opposition presidential candidate Jude Célestin . Célestin qualified for the runoff against Moïse but said he will not participate in a second round until, among other things, the recommendations of an electoral commission charged with evaluating the vote are applied. Thirty years to the day after Haiti’s last dictator fled the impoverished nation as it took its first wobbly steps toward democracy, another leader stepped down Sunday, without a successor to take his place. 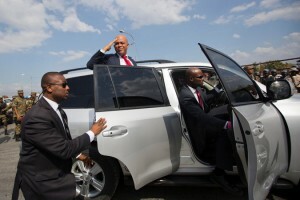 The president, Michel Martelly, left office amid an electoral crisis that underscored how Haiti has struggled to maintain democratic order since the 1986 ouster of Jean-Claude Duvalier. 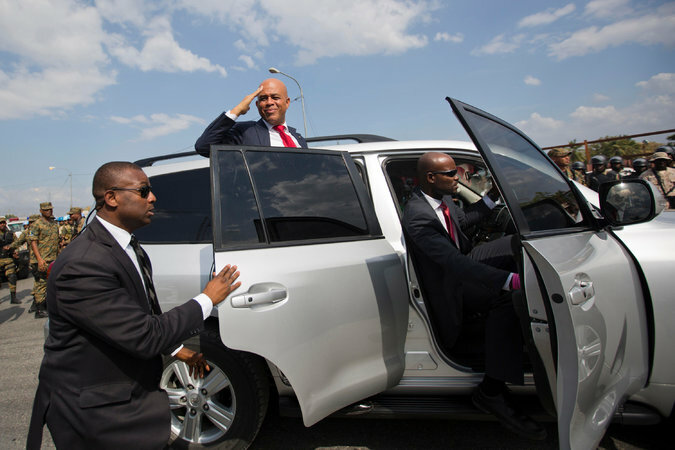 Mr. Martelly departed at the end of his five-year term, thanks to a last-minute agreement that laid out steps to choose a provisional government to take his place. Although the agreement left major doubts about who will govern the nation in the months to come, experts hailed it as an important move toward at least temporarily resolving a political impasse that had put hundreds of protesters on the streets. At least one person was beaten to death Friday, as former army soldiers supporting Mr. Martelly hit the streets to counter protests that demanded his ouster. The head of an Organization of American States special mission to Haiti says he’s confident that all sides will reach a solution in the coming hours on how Haiti will be governed after President Michel Martelly steps down this weekend. "In overthrowing me you have cut down in Saint Domingue only the trunk of the tree of liberty; it will spring up again from the roots, for they are numerous and they are deep."